This is evil, theres no other word for it. This is the digital delay Satan would use if he fancied grinding some sound up in a manner sure to induce disgust in those with the strongest of stomachs. 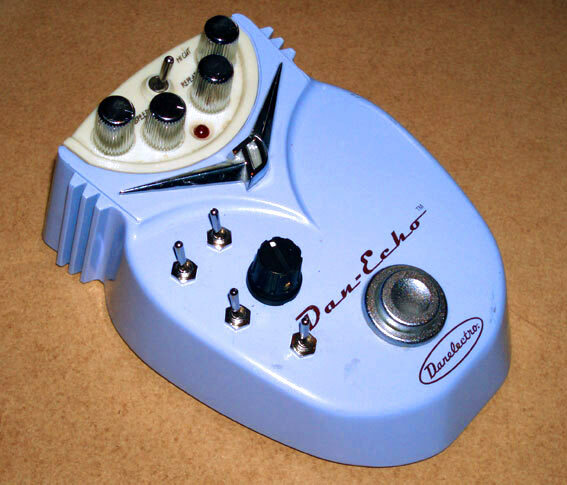 The Dan Echo DE1 is a remarkably impressive sounding digital delay pedal based around the PT2395 digital delay chip. 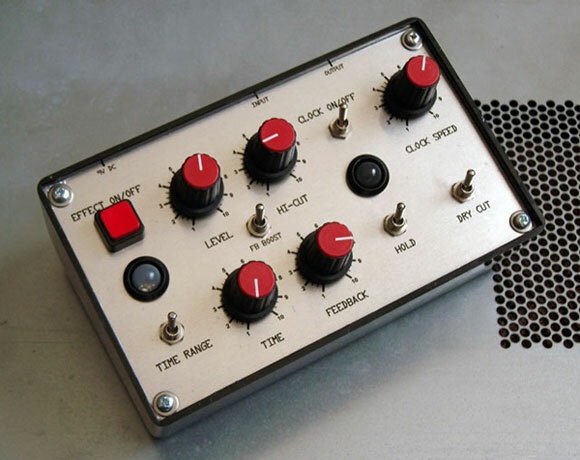 It features knobs for delay mix level, delay time, repeats/feedback and a Hi-cut knob that supposedly emulates tape delay FX. Theres also a delay time range switch that appears to extend the delay time at the expense of sampling bandwidth, not that you'd ever really notice with a guitar. So far so normal, but we have added 4 mods to this pedal that take it for an average bit of kit to something a whole lot more unpleasant. 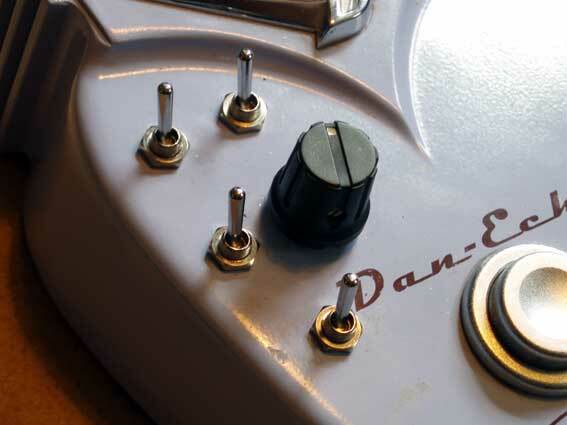 Before someone points it out, yes we know the new controls are going to get kicked off by a guitarists feet, but the guy who commissioned this isn't a guitarist and didn't mind where the new controls were placed. HOLD / LOOP SWITCH: This grabs and loops whatever is in the sample RAM buffer at the time. The loop speed / pitch can be controlled with the delay time controls. FEEDBACK EXTENSION: This switch takes the maximum feedback well over 100% for those rising and distorting dub delay effects. 100% WET SIGNAL: this removes the dry signal so the unit is easier to use on a mixing desk aux send loops. On some settings the dry signal can be heard to bleed through slightly but this is unavoidable as the original designers never considered this kind of crosstalk might ever be an issue. 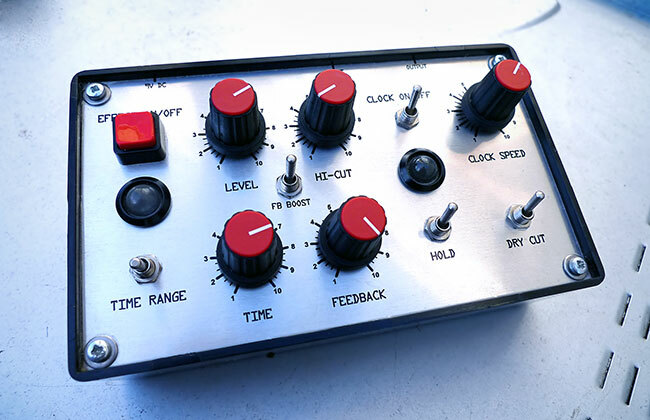 CLOCK SPEED / DELAY TIME: This consists of a new delay time knob, and a switch to select between the normal delay time knob and the new knob. The new knob directly controls the system clock speed of the PT2395 chip and therefore the delay time, but as the delay time is extended by up to 15 seconds using this knob, the quality drops in direct corresponding to the length. This means the delays are very hifi at the top end, but at the bottom they turn into a huge wall of sludgy sample aliasing noise. Setting a fast delay time, running a sound through it and activating the hold switch, then taking the clock speed down, results in what can only be described as the soundtrack to the apocalypse as rolling walls of crunching noise assault you. The effect is not destructive so when you take the clock speed back up again your held loop will be perfectly intact. Another interesting feature is that you can use it as a kind of bit crusher effect by removing the dry signal with the '100% wet switch' and then playing audio through the delays digital convertors running at horribly low sample rates. Admittedly the output is somewhat delayed but you can use this technique to destroy just about any sound. 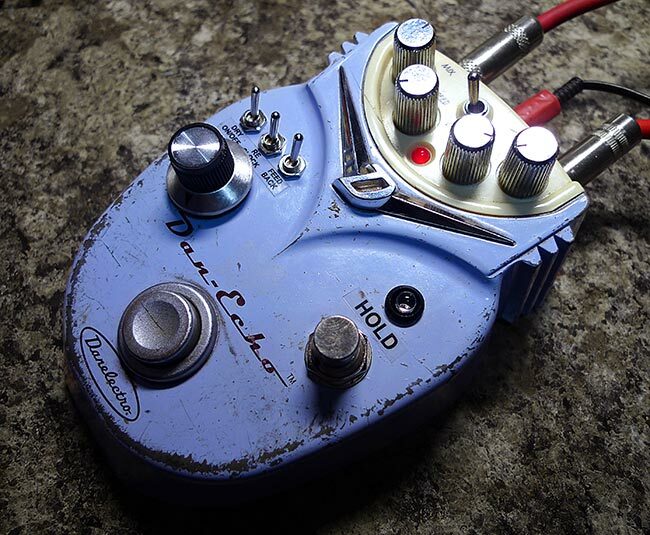 An unusual point about Danelectro pedals is that the effect is always running. All the effect on/off footswitch does is either mix the delay into the output signal or cut it. This means that you can turn on the hold effect while playing, but with the delay turned off, or turn on the hold and then turn off the delay, and it will still keep the loop running even though you can't hear it. Then you can turn the effect on and off with the loop still running. Have a listen to the demos below for an idea of what this thing can do. This is exactly the same unit, but rehoused in a slope fronted desktop case. It has all the same features as the modded pedal version, plus two 10mm red LED's to indicate effect on/off and the new clock control on/off. The version above is actually designed for guitar use. It omits the 100% wet signal switch, but has the Hold switch replaced by a footswitch and LED. 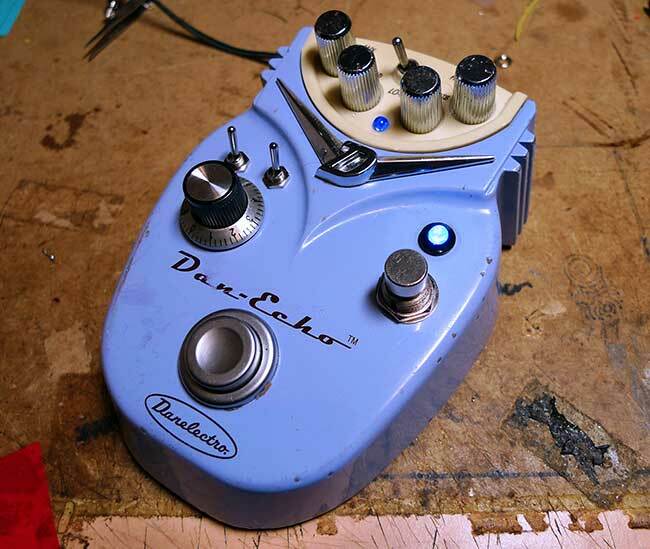 Guitar pedal version that includes the 100% wet switch.